I'm saying at tensions in the low 40s or lower, it loses its magic pretty fast. Strung closer to 50 and it's playability lasts much longer. I just think it plays better at lower tensions but didn't last as long. I just strung up a set of blue rock n power. I haven't played with it yet, but from a stringing perspective, it feels like a very different string from ultra cable. Seems to be stiffer and not noticably thinner. It's supposed to be more powerful. I have my doubts, but I'll report back a comparison to ultra cable once i get a chance to hit with it. Yes it does not seem to much thinner than UC. I did notice that the edges on the RnB seemed to be sharper than the UC. geeeehsus ... I tried it at 48-46 in my DR98, and next time will string lower but I definitely warmed up to the string, it's really solid. Wow. That's pretty low I would think. My son's friend had his Babolat APD Team strung at 57. I thought that was super high. But apparently it must lose lots of tension because he was playing just awesome with it. 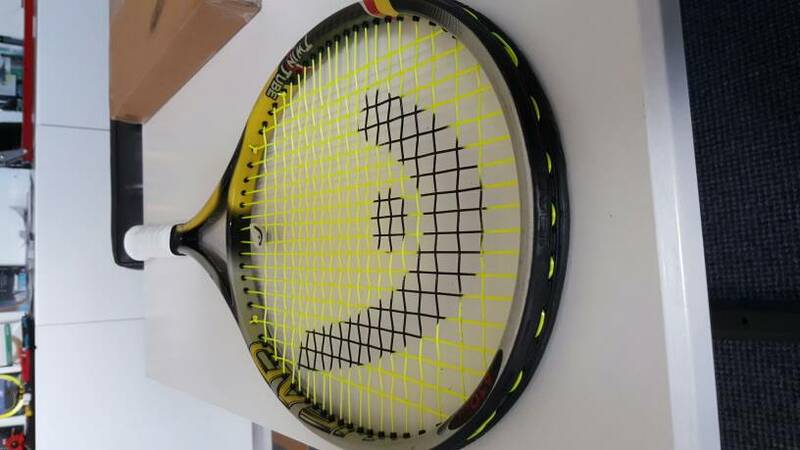 Even though the DR98 is a 16x19 string pattern, have you seen the string density on this racquet? Mid 40's was my preference on my previous xi98, ai98 and dr98. Anything above 50 was like a board on these frames. But some people prefer the feel of a stiffer stringbed. My usual tension is about 52lbs on most other frames. It feels fine at that tension, I'm used to high tension poly. I have tried all different tensions and prefer it at 60lbs. Or above. I know many really like low tensions and that's good, but that does not mean everyone has to use low tension. Have any of you Ultra Cable users out there used it as a cross to NG? Curious how it would play because it has one of the lowest string to string friction measures out there and it's very slick, but of course the dagger might be the sharp edges cutting the mains. Anyhow just curious if anyone has tried it. I've been thinking about trying it actually. I have a feeling it would work really well. The flat profile of UC might not cut into the gut as quickly as a round poly. For example, when using UC in the mains and crosses, there is very little notching of the main strings. If you cross UC mains with a round poly, the round digs and notches the UC like any other poly. I have a half set of UC and plenty of Gut. I may try it out. Btw, i tried a hybrid if UC mains and Red Ghost crosses. I've never played with red ghost before so i don't know anything about its characteristics. What i got was a power monster though. Serves were eye poppingly powerful and the sounds..... The sound was turning heads. For a 44 year old guy, i still have a good serve. I have been radared several times in the 108-110 mph range. This UC/RG combo had to have been much higher than that. I was surprising myself. The pop sound of the ball off the stringbed sounded like 120+ serves I've heard at ATP events. Guys 2 courts away were making comments about my serves, too. I was hitting corners all match long. Slice serves were wicked too. Topspin and kickers were good but nothing out of the usual, though. Overall, It was an impressive string combo for serving. Now..... On the flip side..... I lost way too much control. I was spraying groundstrokes all over the place. I felt like I lost the amazing topspin of a full bed of UC. Topspin was still good but the power level was way too high. I really had to concentrate to keep the balls from going long. I finally started aiming for the service line on all my shots to keep the depth under control. I'll try this combo again but at higher tensions. I keep thinking about those serves though..... WOW !!!! What tensions did you string at? I'd be curious at your findings. I have a full set of UC in the bin. I was saving it for my son to try out in a hybrid. I have a full set of VS Team as well. I was going to use it to hybrid with Cream. But this Gut/UC combo sounds very intriguing mostly due to how low the string to string friction is for UC. I strung the UC mains at 44 using the JET method. The crosses were strung at 49 with extended pulling times (about 30 seconds) before clamping off. My stringer is an Alpha Revo with a Wise 2086 Electronic tension head. I use constant pull set at the slowest pull setting. I like the JET method of tensioning the mains.... opens up the sweetspot and evens out the tension across the mains, IMO. On the crosses, I don't use the JET tensioning adjustments, but I do hold the tension about 30 seconds before clamping off. It's not really that complicated if you take your time and use it for a few string jobs you should get it down. But I know some guys swear by it I did not notice much difference in using it. I don't want to open up the sweet spot I want the strings to have good control. i have uc @ 50lbs on my PA for 3 weeks now..
it really doesnt lose much tension. very good tension wise..
its a little lose . but it was a little lose from the first day.,. as a footnote. i have not lose a league match with this string in my racquet. short angles and wristy spinny forehands and backhands just seem to happen with this string. depth is sometimes an issue. but really thats with most full bed poly jobs. its not as low powered as 4g..
if i were to restring today.. i would go up to 52-54 lbs..
i like a little more rigidity for the most part. . But again.. i am playing my best tennis with this string. Good review I agree this is a very good string. Nice string but I have found the sharp edges on the knots just cut right through the grommets on my DR98s. Anyone else have this issue? I am curious though, how do you think it evens out the tension on the mains? What exactly goes on? And why wouldn't you use the jet method on the crosses? Wouldn't you need to apply it to the whole racket to get your ball pocketing effect out of the JET method? Ultra Cable doesn't notch on itself as much because it's a slick hard square rubbing on a slick hard square. I would also be afraid of the Ultra Cable notching gut especially with how Natural Gut can change properties depending on the temperature and because Ultra Cable is sharp as F***. I knicked my knee with it at one point when I had accidentally hit myself with my serve. The best way I can relate this is.... take a sharp knife and rub it sharp side on the back of your hand. You will end up shave some hairs off your hand and I imagine it would be the same result with gut. This is just my 2 cents but definitely give it a try if you have the time and resources, I'm curious what your results will be. Yeep, not much you can do aside from push the string a bit away from the grommet as you are tensioning to alleviate some of that pressure. I can't resist picking your brain now that I see you have taken the time to comment on this thread. And thank you for taking the time to do so. From your vast knowledge of polys, how do you rate ultra cable ? Is it something you would recommend to pros on tour? I have gotten away from the JET cross method but I still use the extended pull times on the crosses. one reason I don't use the JET on the crosses is because I start my crosses with a starting knot and not the way the they do it. So, I don't need to up the tension on the 1st 3 crosses to compensate for tension loss when tying off the knot. That's the main thing. On the last 2 crosses, I do up the tension to compensate for the last knot, though. as far as the mains, my racquets have 16 mains. Going from the center out, you have 8 mains on each. Using the JET method, I tension the inner 4 mains at my reference tension. The next 2 main, I drop 4 pounds. When cutting out strings, have you ever noticed that mains 5&6 are usually tighter than the others? I guess that why the JET method drops the tension on 5&6. Then, bring the tension back up to your reference and skip to main 8. tension it. then, up the tension 4 more pounds and finally string up main 7. Tie off... it's very simple. the lower 5&6 make the mains feel more even. and the 7-8 swap works well for keep tensions even all the way out,too.... while minimizing tension from the knots. It doesn't work well on all racquets, though. sometimes, it's just too hard to accomplish due to stringing patterns, hole sizes, etc. Thank you for explaining it to me. I had done the JET method in the past but I never got to participate in the google chat hangout they did where they explained exactly what was done and why it was done. That helps to clear up some things. The string bed never felt good off the stringer but started feeling better after one hitting session. I would always tell people to give it a try and let it break in but most people want it ready to go at that moment. I agree, not only on the knots, the sharp square shape has blown 3 or 4 grommet holes in more than one of my blades. Of which TW is out of stock until June. I wondered about the impacts some of these shaped strings have on the life of the grommets. As I was stringing Proline II Rough, I could feel it sawing at the grommets as I was pulling the string through. Then as I was stringing my daughter's racquet with Babolat Xcel, it was like pulling silk through in comparison. I've been using this string for 7 months now and I've convinced a teammate to try it. He wants to string it at 42lbs . Anyone else put it n their stick at that and have previous play at around 50lbs ish? I'm curious what the change would be on this string as I feel it's fairly soft. Don't string it lower than 48 lbs as the string bed will become too powerful. I am a 4.5 player and I just used UC at 44/42 lbs. last night! I could not control the power. It still feels somewhat soft around 50 lbs. I have used it at 40 lbs on several occasions and I had great control with it. There is no such thing as a tension that is too low to control. It's a personal matter, and a matter of getting used to. Remember, Jack Sock strings his racquet in the 30s, and he has one of the biggest forehands and RPM. ^^^ Agreed. Tension is preferential. Racquet pattern, swing characterics, etc all play a factor. Also given that ultra cable is super low-powered, 40-42 pounds is certainly not out of the realm of suitable tensions. This last go I went 48/46 in an 18x20 blade and might drop it a touch. Been playing with UC main V-Pro cross. Great combo! The V-Pro is the 18g super cheap on TW. Awesome snap back. I've been enjoying ultra cable in a hybrid too. Playing it with WeissCannon Red Ghost in the crosses. It's been a great combo. I just strung this up last night in my 18X20 blade. Just like someone else has commented, these strings seem thicker than stated. I replaced my luxilon adrenaline rough 1.25 mm with these supposedly 1.23 mm strings & my racket weights 4 gms heavier. I was hoping my racket would end up more headlight. I got rained out tonight but hope to hit with it soon as it seems to have some good reviews in this thread. While stringing it up, the shape, recoil, & stiffness felt like diadem solstice power - I hope it feels more crisp than it though because I didn't like the feel of it when playing. How does WCUC compare to Volkl Cyclone and RPM Blast? Never tried RPM Blast. So can't comment on that one. WCUC is lower powered compared to Cyclone. Spin wise WCUC has more spin than Cyclone. WCUC with slick round poly (I have revolve) cross is great combo. Fresh stringed is firmer than full bed of Cyclone. But after hitting 30 minutes or so it becomes more comfortable than Cyclone. Caveat is WCUC being low powered I string about 4-5 lbs lower than Cyclone. Spin with WCUC can be little unpredictable at times. I am pulling my inside in forehands out almost every time with WCUC if I go close to the line. Ball just seems to keep spinning forever. I let my opponent play with my WCUC racket and balls had lot more spin than what he normally hits with (shaped Gamma poly). So far I feel durability/play ability will be better than Cyclone. How much better I don't know yet! Cyclone for me lost too much tension around 6 hour mark. I string my own rackets and I would not bother stringing WCUC in cross. Square profile would be nightmare to string as cross. Flat part of WCUC sits on the cross string and slides way more easily (when you try by hand). I like it better than rpm or cyclone. Cyclone feels plasticky and stiff (for me). If I go low ( 42-46lbs) on Cyclone or Blast, it will be too powerful. UC at 44 is a nice compromise for me. Still got power, playability at net, and control from spin. My racket is Pro Kennex Q5 295. I am no power hitter, so tension maintenance is not a problem. It still hold nicely after 20 hours. One drawback is weight. 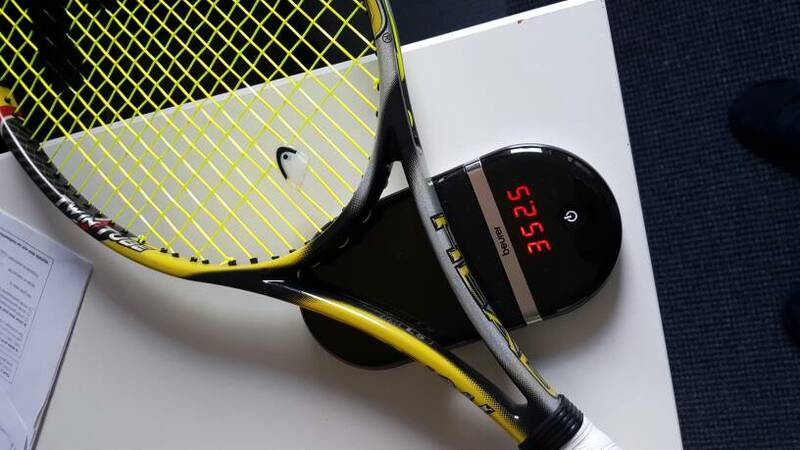 With 24gram for a12m set, weight difference after installed at my racket is around 4-5 gram from similar sized string. Yes your right when I use a full set of UC i can feel that the racket is heavier. Anyone experienced a change in tension (going tighter / higher) of the Ultra Cable after flying for 2 x 2 hours? I was happy with UC @ 46 lbs in my PK 7G until I tried 40 lbs, works for me. I just ordered a set. I normally use Solinco Revolution 16 gauge 1.30. Curious if they are going to be similar. Guessing UC will have more spin (2X on paper), and play softer (20% softer). All the other numbers including tension loss, energy return etc look similar according to the TW comparison tool. I'll probably string it at 57 like I do with the Solinco in my TC95 18x20. Update: I finally got around to trying Ultra Cable as a cross with VS Team Natural Gut. I was worried that the UC was going to chew up the previous 17 gauge gut. On the contrary, UC was unbelievable easy on the gut. Actually.... It's a fantastic cross for gut!!! I strung it up in a Yonex Vcore SV 98+. 52 # for the gut mains / 48 # for the UC crosses. I hit for an hour on Monday and another hour on Wednesday. Each time with 5.0 former college players. It was all ground stroke rallying as hard as we could hit it. Heavy spin was the name of the game. Every water break, I kept checking the gut.... And it never showed any signs of wear! Nothing.... I couldn't believe it. Give UC a shot as a cross with gut. You won't be disappointed. It's a pretty slick string and slides easily on the flat square surface. I'm on the fence about this string. It does create crazy spin and rips fuzz off tennis balls but it feels a little plasticky similar to hyper G. Tension maintenance is ok not great.